The price of the international currency Bitcoin surged past $5,000 on Thursday, and reached $5,809 on Sunday, before falling back to $5,712.97. It started the year at a measly $966, and has risen meteorically all year, if you don't count the fact that it fell to $3226.41 on Sept 14 from $4950.72 on Sept 1. I've been asked by several people recently about my recommendations for investing in Bitcoin. Investing in Bitcoin is the road to disaster. I literally cannot think of a worse investment today than Bitcoin, or the various copycat newcomers, such as Ethereum. Bitcoin is almost literally a Ponzi scheme backed by nothing but air. Let's take a look at some other investments. So when you're finished, you get a number that represents the value of the apartment building for investment purpose. If the value is, say, $625,000, then you know that you should spend no more than $625,000 for the apartment building, because that's all it's worth. Another investment is stock shares. A stock share is backed by the company that issues the shares, and the company's earnings are published in annual reports. The higher the earnings, the more the stock share is worth. This is usually measured by the "price/earnings ratio," which is the price of a share divided by the annual earnings per share. Historically, investors expect to earn about 7% return on investment in stock shares, which means that the P/E ratio should be around 1/.07, or about 14. Today, the average P/E ratio is 25, so stocks are way overpriced and in a bubble, as I'll discuss below. Another investment is tulips. I'm referring here to the historic "Tulipomania bubble" that occurred in Holland in the 1600s, when the price of a single Tulip bulb rose to be higher than the price of a house. The bubble burst in 1637, causing a financial disaster across Europe. "By the later stages of the mania, the fusion of the windhandel with paper credit created a perfect symmetry of insubstantiality: most transactions were for tulip bulbs that could never be delivered because they didn't exist and were paid for with credit notes that could never be honored because the money wasn't there." In other words, at the height of the bubble, there was this "perfect symmetry of insubstantiality": A person would buy a certificate representing a tulip, and give in return an IOU. The buyer could at least hope that the certificate represented an actual tulip, just as the purchaser of an apartment building knows that there is an actual apartment building somewhere. But with Bitcoin there's nothing. If you spend money on a Bitcoin, and you don't get rid of it right away, then you have nothing that backs it up in any way. Before proceeding, let me put on my Senior Software Engineer hat. The "blockchain" technology is what the Bitcoin is based on. This is a solid technology, and it's a major advance in programming data structures that goes far beyond currency in leveraging the power of the internet. The problem with internet transactions in general is that if you do something online then you have no way of proving what you did. If you buy a coat online then you may be able to prove through your bank (a third party) that you paid for it, but you can't prove that you bought a coat unless the merchant confirms that you did. That's fine in most cases, but blockchain technology allows you to make any sort of online transaction and prove that it occurred, without having to depend on a third party. This applies to such things as financial transactions, smart contracts, and even voting. So, whatever the value of Bitcoin is, the underlying technology is solid. So now let me take my Senior Software Engineer hat off, and again put on my Prophet of Doom hat. There's a concept in Bitcoin technology called a "hard fork." Technically, it simply means that the blockchain software is being updated to a new version where transactions might have a different representation. Ideally, everyone simply uses the new transaction format. But since the Bitcoin community is mostly a collection of airheads, it's possible to continue using both the old and new transaction formats, so that now there are two currencies where there used to be only one, and so there's the opportunity to create two bubbles instead of just one. "Yet it seems, investors believe the momentum is warranted given the results of the last hard fork in August, which split the network in two, but did so in a way that fairly safely created a new asset called bitcoin cash. Distributed to all bitcoin owners at the time of the fork, investors were suddenly given an equal amount of valuable cryptocurrency (bitcoin cash has held relatively steady around $300 per coin, but has traded for as much as $1,000). Far from a risky proposition, investors see that extra value as just created out of thin air and delivered to existing investors for free." Anyone who reads these two paragraphs would have to laugh and think it's a joke. But not for these airheads. These investors think of a hard fork as "extra value as just created out of thin air and delivered to existing investors for free." So the term "hard fork," which is really an obscure technical term for a software update, has taken on a magical, bewitching aura as something that makes free money out of thin air. And there's a new Bitcoin hard fork coming up soon, and these investors are looking forward to it, because they're going to get more free money. By the way, Bitcoin competitor Ethereum is implementing a hard fork starting yesterday (Sunday), and investors are torn between hoping for a free money bonanza, and a total disaster. Bitcoin isn't the only investment that's in a huge bubble that could implode at any time. There are $8 trillion globally in in corporate and government bonds with negative yields, which means that you invest $1,000, but only get $990 when you sell the bonds. In other words, you don't earn money by investing -- you pay money to invest. But people do it anyway, because they perceive these bonds to be safe havens in which to store their money, and they're willing to pay a price for that safety. But low or negative interest rates on bonds means that the prices of the bonds are astronomically high, so bonds are also in a huge bubble. If the Fed and other central banks start raising interest rates, which they say they're going to do, then the values of these bonds could come crashing down. Watching CNBC this week, I learned that stock traders are unhappy because stock market volatility (measured by the VIX) has been extremely low. Traders love the chaos of high volatility, with stock prices jumping up and down, because they're good at making timed trades and making money from them. But with the markets so quiet and placid, traders are unable to make money. Therefore, traders are hoping for a geopolitical crisis, like a North Korea nuclear crisis or a major Mideast war, to increase volatility so that they can make money. Many people are crediting the large stock market rise of 19% as a "Trump rally," but taking credit for a stock market rally is extremely dangerous, since then you get the blame when the stock market falls. According to Friday's Wall Street Journal, the S&P 500 Price/Earnings index (stock valuations index) on Friday morning (October 13) was at an astronomically high 24.55. This is far above the historical average of 14, indicating that the stock market bubble is still growing, and could burst at any time. 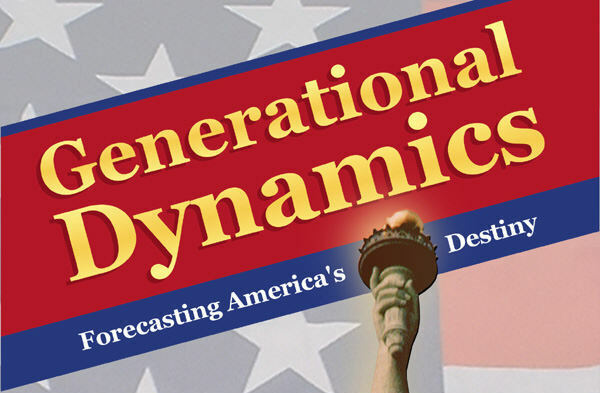 Generational Dynamics predicts that the P/E ratio will fall to the 5-6 range or lower, which is where it was as recently as 1982, resulting in a Dow Jones Industrial Average of 3000 or lower. There's actually been a lot of debate and discussion recently on whether a stock market crash is coming, much more discussion than I've heard in the past. One person comes on and talks about price/earnings ratios or other stock price measures to show that stocks are way overpriced. Then a kid comes on, who seems barely old enough to remember the financial crisis of 2008, and says that the American economy is resilient, and there are no signs of an impending crash, and no reason for one to occur at this time.